Geographical Range: Indonesia, East Malaysia (Sabah and Sarawak - Borneo), Peninsular Malaysia, Vietnam, China, and Laos. Habitat: Their natural habitat includes humid, tropical rainforests, where they spend the majority of time in tall trees. Diet in the Wild: Javan Gliding Frogs are carnivorous. Their diet consists of many different larve, insects, and beetles. Adults can reach up to 3.5 inches in length for females, and slightly smaller for male specimens. 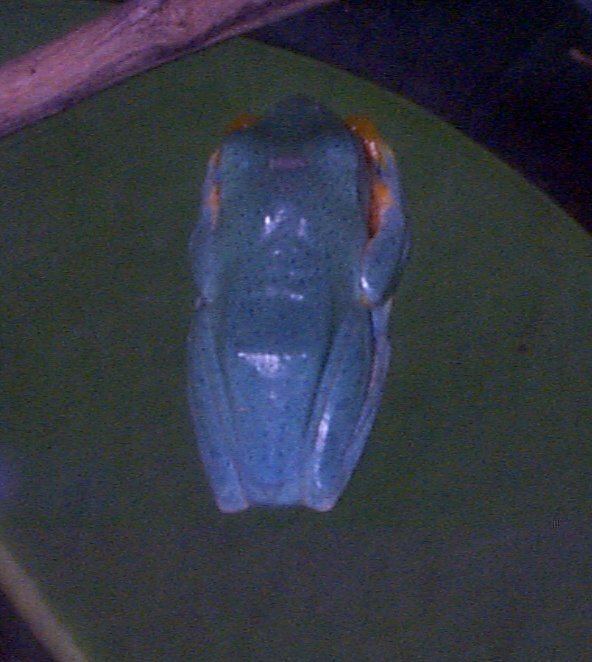 The body is light green to dark green with tiny dark spots around the back and head. The green coloration varies from light to dark. The eyes are light yellow, light greenish, or light gray, with a black horizontal pupil. Males are more elaborately colored, with orange, green, purple, black, and yellow coloration on the sides of the abdomen and on the webs of the feet. Females are slightly more understated, with reduced webs and less-brilliant coloration. Males will also develop nuptial pads on the front feet during breeding season. R. reinwardtii have large, colorful webs between each toe on both the front and hind extremities. These webs are used to glide from tree tops to the ground, and aid in catapulting from leaf to leaf. The feet also possess adhesive discs. They breed during the rainy season in their natural habitat. Pairs, usually accompanied by several other mating pairs, will construct a foam nest where the female will deposit up to 800 eggs. The foam nest is strategically built over a body of water so that the eggs or hatched larvae fall into the water to further develop. In the wild, a foam nest may be a compilation of several pairs' efforts, making the nest rather large. While at the zoo you won't see the frog moving much if any at all. The frog is generally hiding and can even be difficult to find in the tank. If you look hard enough you can usually find him sitting on a leaf much like you see in the pictures. Asean Regional Centre for Biodiversity Conservation.